Matching scents with occassions.. 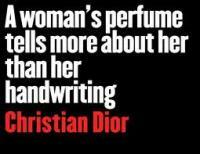 When do you wear what perfume? A good perfume provides the finishing touch for any outfit, but do you know when to wear different types of perfume? Do you know for example, that a floral, fruity perfume is an amazing choice for a lunch meeting, while a strong, oriental one is definitely appropriate for a late night cocktail party… Take a look at the most popular of the different types of perfumes available and how to best fit these with different occasions!